Loss of motion of the muscle in the soft palate, so that the palate does not properly elevate. Normally, the soft palate elevates to seal the nasopharynx when swallowing or when pronouncing any non-nasal sounds (in English, all sounds except for “n,” “m,” and “ng”). However, if the vagus nerve is damaged high in its course, near the base of skull, then the palate on that side can lose its ability to lift, and it remains down during the aforementioned tasks. A patient with palate paralysis might experience not only hypernasality (speech resonance quality resembling that heard with cleft palate) but also nasal regurgitation, especially of liquids (“water comes out my nose when I swallow”), and also nasal emissions (a slight hissing sound that comes through the nose when the person produces strong consonants). This young woman sustained facial bone and skull base fracture during an auto accident. In this nasopharynx view, note that her right palate (left of photo) elevates fully (long arrow), while the left side only partially (short arrow). The palate branch of the vagus nerve is injured on the left (right of photo). At rest, the pharynx appears flat and symmetrical, but there is a question whether the midline may have migrated to the patient’s right (left of photo). The vagal branch to the pharynx is also injured on the left (right of photo). By eliciting a very high-pitched voice, a pharynx contraction is recruited and now we can see that the pharyngeal wall pulls to the right (horizontal arrow) and the constrictor muscle squeezes inward only on the right (long arrow at left of photo). This confirms good right vagal function (left of photo) and damage on the left (not pictured). After eating a cracker and attempting to wash it away with water, the residue is primarily in the vallecula and left pyriform sinus. 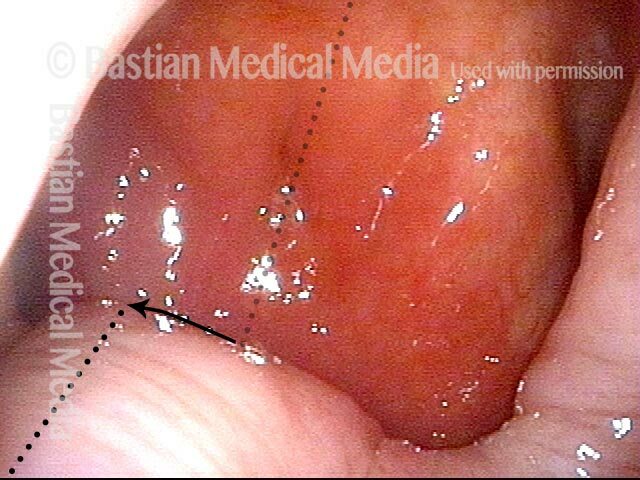 Arrows show how the pharynx can squeeze during swallowing in order to clear out the right pyriform sinus (left of photo). With no active muscle on the left (right of photo) to clear out the pyriform sinus, it pools food.